RNA-sequencing (RNA-Seq) bottlenecks start with library preparation! Is it possible to prepare a RNA-Seq library in a simple and fast way? And how to avoid the bottlenecks of current RNA-sequencing library preparation? The other challenge is to be able to manage several samples in parallel. That’s one of the main reasons why RNA-seq projects can queue up for weeks. There are lots of kits for library preparation available, which all look the same and require high skills in molecular biology and… patience! Choosing the most convenient and fastest one is already a challenge in itself, even before performing RNA-Seq. So, is RNA-seq library prep an irremediable burden in RNA-Sequencing? Well, not really and for 2 good reasons! ScripSeq V2 Library Preparation (click to enlarge). Actually there is one clever solution here which is unfortunately not well-known enough as yet (but this post will repair this injustice!). Despite being successfully used for several years now, this technology is not yet a standard in sequencing platforms. It was improved in Version 2 in order to answer tricky RNA-seq projects with FFPE. ScriptSeq V2 is sensitive to gDNA contamination. As long as gDNA is completely removed, at least 98% of the reads will be well oriented, and it facilitates analysis. With limited training in molecular biology, users can now prepare dozens of libraries in parallel in only 4 hours! Yes, you read it correctly, “hours” and not days anymore! So today, the complete workflow from only 100ng of total RNA, to a ready-to-run RNA-seq library can be done the same day with the ScriptSeq Complete kit (again from Epicentre-Illumina, also called Epibio). This kit includes the Ribo-zero technology for rRNA depletion (1.5 hours) and the the ScripSeq V2 for the library preparation (4 hours). ScriptSeqComplete Process by Epicentre-Illunmina. Source: being bio-reactive. These are 2 really good ways to boost RNA-sequencing ! 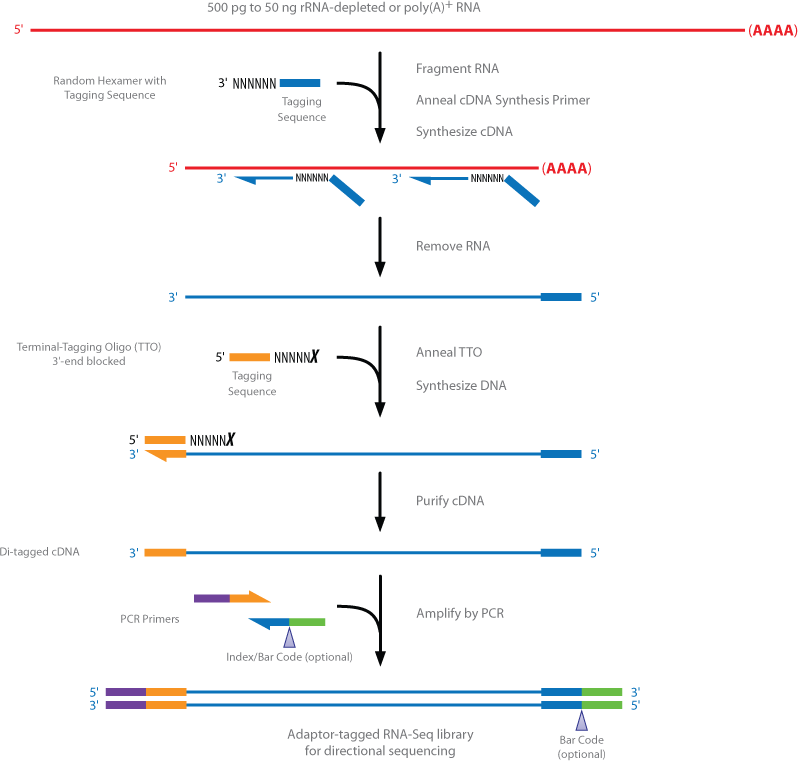 Are you looking for easy and efficient procedures for RNA-Seq? Have any tricks to share with other molecular biologists? Leave your comments and share this post with everyone swamped all week catching up and working on various RNA-Sequencing libraries!